In recent weeks, Sam and I have been inspired (99% by Lobster & Swan, 1% Pinterest) to give our front garden and porch a bit of a makeover. The front door had been hidden away behind the same old shrubs for years, and we just wanted to rip them out and make it feel a bit more like 'us' and bit different from everyone else down the road. I nipped into my local B&Q and Homebase for some bits and bobs that I've been meaning to tick off. I also went to TK Maxx, Asda Living, The Range and Sainsbury's on my travels-- on the hunt for pots at every corner-- but didn't have too much luck. I managed to get a few plants in Homebase, including a small Ivy plant which I thought would look nice spilling out a pot and draped across the floor. I figured that would be good throughout the winter when all the summer blooms have gone down, but for the meantime I also picked up a white Nemisia plant because I wanted something white and floaty, and a beautiful French Lavender plant which I anticipate should make our porch smell fab to waft through. 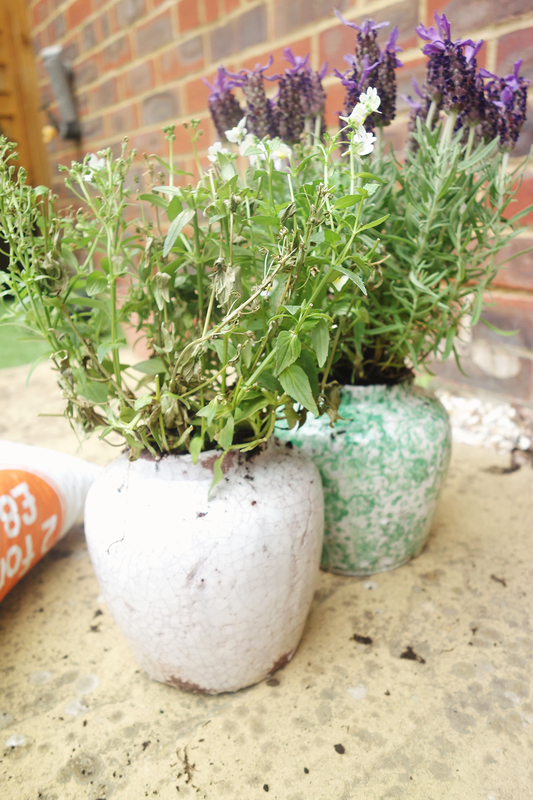 I also picked up a bit of Exterior Emulsion to jazz up the wooden parts of the porch as they were looking a bit 'vintage' (also, very spider web-y). The other renovation that has been high on our list for a while now is the upstairs bathroom. It's fine, it's clean, it's just very cream and not a great reflection of us either. We're both product junkies (sorry Sam, I've outed you) and can't cope not having storage for all our lotions and potions. We haven't been able to invest in good shelving though because we can't find bloody bathroom paint we like. 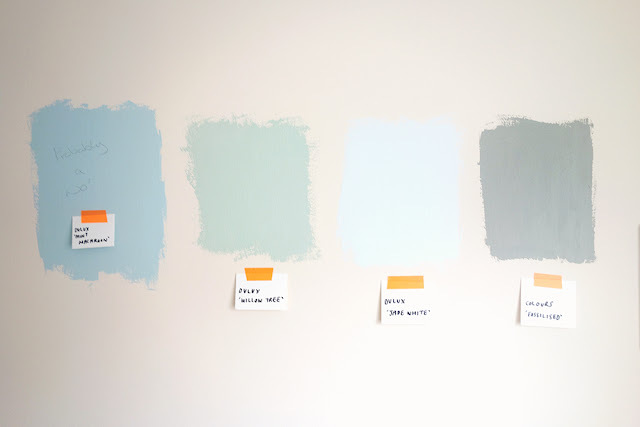 We're aiming for a very light green-grey toned emulsion (similar to the Farrow & Ball 'Pigeon' colour we have in the bedroom, but much brighter) and it just doesn't seem to exist. Following the horrific disaster of Dulux's 'Mint Macaroon' a few weeks ago (it's sky blue!! Where's the mint?? ), I braved 'Willow Tree' (it's turquoise), 'Jade White' (minty blue, nowhere near Moss green) and Homebase own brand 'Colours' in the colour 'Fossilised' (beautiful khaki hue, ten times too dark). For now, all the swatches are duds, but today I caved on the way home from work and picked up another sample from Farrow & Ball (it genuinely grieves me to imagine buying another tub of the stuff) in the colour 'Mizzle'. On the sample tiles it looks like it should be perfect, which makes me irrationally angry, and so I've painted a swatch on the bathroom wall-- without a label-- and I'm hoping when Sam gets home he hates it and we can act like it never happened. Sadly, at the mo it looks nearly perfect (ugh!) if not a teeny bit too dark (phew). We'll see, people! If you hear that I've wound up buying more from F&B I want you to know I did it with my tail between my legs. 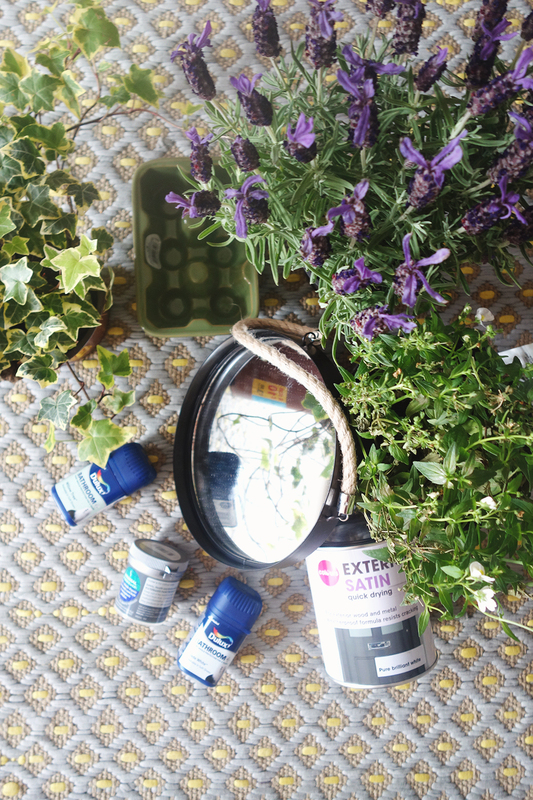 The last few bits I picked up (not including compost, which was too boring to photograph) were from Asda Living. I bought that little round mirror with a rope handle which I thought might spruce up our downstairs loo (also needs painting) and a little egg holder for Sam. He's desperate to get some chickens (recently, also quails) and everywhere we go he has his eyes peeled for egg storage solutions. This little green one was £1.50 in the sale (mirror was £4), and I thought it might bring him some small joy. It's the little things! Until next time folks, I hope you enjoy the extra post per week! They won't all be about compost.